Launch of SpaceX's commercial Dragon cargo freighter to the International Space Station will be delayed until at least early May to give engineers more time to wring out the craft's software, the company announced Monday. The launch of Dragon, aiming to become the first commercial spacecraft to reach the space station, was scheduled from Cape Canaveral on April 30, following three days later by ship's planned approach and berthing with the orbiting laboratory. A review of comprehensive testing of the spacecraft Monday prompted officials to order a delay in the flight by about one week. A potential launch opportunity is available as soon as May 7, according to a NASA source familiar with the mission. "After reviewing our recent progress, it was clear that we needed more time to finish hardware-in-the-loop testing and properly review and follow up on all data," said Kirstin Brost Grantham, a SpaceX spokesperson, in a statement released Monday. "While it is still possible that we could launch on May 3, it would be wise to add a few more days of margin in case things take longer than expected. As a result, our launch is likely to be pushed back by one week, pending coordination with NASA." The SpaceX-led mission is a demonstration flight sponsored by NASA's Commercial Orbital Transportation Services program. A successful demo flight would allow SpaceX to begin operational round-trip unmanned cargo runs to the space station later this year. SpaceX and NASA agreed to a $1.6 billion contract in 2008 for at least 12 resupply missions to haul equipment to and from the space station after the retirement of the space shuttle. Software testing throughout late 2011 and early 2012 was responsible for a series of delays in the mission's launch. 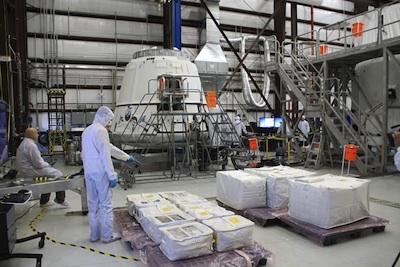 The testing is designed to validate the Dragon's ability to safely fly in close proximity to the space station, a tightly-controlled operating sphere requiring redundant hardware systems, fault-tolerant computers and robust software. The space station's robot arm will snare the Dragon capsule as it floats about 30 feet underneath the complex. Launching May 7 would require engineers to sign off on the craft's software within the next week. An Atlas 5 rocket launch with a U.S. Air Force communications satellite is booked for May 3, and a two-day slip in its flight could affect SpaceX's chance of launching May 7. The Air Force range network responsible for space launches from Cape Canaveral needs a couple of days to reconfigure tracking and communications assets between rocket missions. Another launch opportunity May 10 could also be available, but the capsule would reach the space station around May 13, about two days before a fresh three-person astronaut crew is due to blast off on a Soyuz rocket from Kazakhstan. Space station managers schedule several days between arrivals and departures of visiting spacecraft to give crews time to set up for a new vehicle. The Dragon's flight plan calls for the craft to reach the vicinity of the space station about two days after liftoff, approach the complex for a series of safety demonstrations and navigation tests, then back away for a day while officials study the capsule's performance. Managers could give the go-ahead for the spacecraft to fly within 30 feet of the space station the next day, allowing the outpost's robot arm to grapple the unmanned spaceship and berth it to a connecting port on the Harmony module. A launch on May 10 could give the Dragon just one backup chance for berthing with the space station if there are problems on the first try. Then the craft might have to wait for the docking of the next space station crew inside a Russian Soyuz capsule, a link-up currently scheduled for May 17. The SpaceX cargo freighter could try to reach the station again after May 17, assuming the craft has enough propellant. More launch opportunities in May are available after the Soyuz mission.